SvetaMef 9 months, 1 week ago. Android Nougat 7.1 ROM, LineageOS 14.1 for Galaxy S3 Neo has now arrived via an UNOFFICIAL build. If you want some more Lineage OS ROMs for other devices then stay tuned to the Lineage OS 14.1 page or the latest LineageOS 15 list of supported devices. This Galaxy S3 Neo Lineage OS 14.1 is brought to you by PythonLimited and one more build is by Mad_Johnny. No donation link found for PythonLimited and Mad_Johnny. THIS IS PRIMARILY FOR i9301i. OTHER VARIANTS OF S3 NEO MIGHT RUN BUGGY. THIS IS AN INITIAL BUILD WHICH HAS MANY BUGS. HAVE A BACKUP BEFORE FLASHING THIS AND TRY AT YOUR OWN RISK. Installing a custom ROM on a Galaxy S3 Neo (s3ve3g) may require the bootloader to be unlocked, which may VOID your warranty and may delete all your data. Before proceeding further you may consider a complete backup. You are the only person making changes to your phone and I cannot be held responsible for the mistakes done by YOU. If there is no in-built ROOT or it does not work for some reason then you can try SuperSU rooting guide to gain ROOT access. Download and Copy the GApps and LineageOS 14.1 for Galaxy S3 Neo ROM ZIP to your phone. – Here is a guide explaining Erasing data using TWRP recovery. First flash the Galaxy S3 Neo Lineage OS 14.1 ROM ZIP from device. Then flash the GApps zip from your device memory. – Here is a post explaining how to install Lineage OS 14.1 GApps. Reboot and Enjoy the Nougat 7.1 Lineage OS 14.1 ROM for Galaxy S3 Neo (s3ve3g). 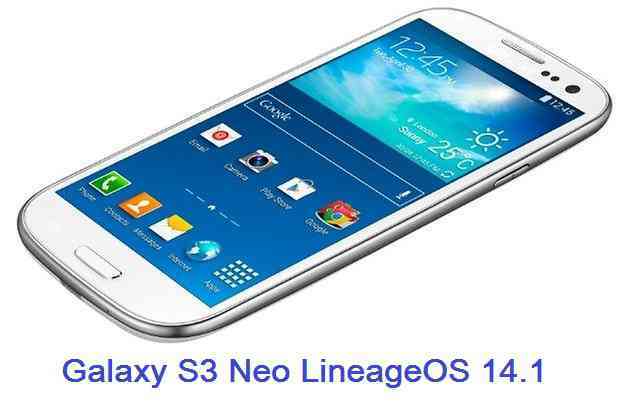 Copy the latest Lineage OS 14.1 for Galaxy S3 Neo ROM ZIP file to your phone. – Here is a post explaining how to flash GApps. Stay tuned or Subscribe to the Galaxy S3 Neo (s3ve3g) forum For other Android Nougat ROMs, Lineage OS 14.1 ROMs, other ROMs and all other device specific topics. If you have found any BUG or have any concerns on this ROM then here is the dev thread link where you can place your concerns. Updated the link but still it is in development phase only and is kind of restricted to developers only. It might not be ready for daily use. Use it keeping these things in mind. Sorry, but firmware is not working. I downloaded and installed this rom, gapps and google assistant on my Samsung Galaxy S3 Neo (seve3g) and everything Went well.but it didn’t boot up.Lineage please fix this for me and all others who want to get this rom.My humble request. I M EAGERLY WAITING 4 THIS!!!!!! Also 7.0 GApps don’t flash,You have to flash 7.1 GApps. I am sad to say that this is not working for me. The phone only show the sign “Samsung Galaxy s3 neo” at the beginning. I have an S3 Neo. ya mine was too stuck on the s3 neo screen!It never booted up!Lineage please fix this!!! I try to install, but the ROM have too much bugs. A message error say ‘bluetooth share keep stopping’ continuosly. Many times. If you install like the guide said, first flash lineage zip, than the gapp without restart, if you don’t have SIM card inside, you can’t go to the next step beacouse lineage configuration keep restart all the time. If you flash lineage zip only, than restart the phone, you can complete configuration process. Than you restart and install gapp from the recovery, but in any way, if you try to connect wi-fi the ROM go in crash. I have added updated builds from PythonLimited and some new builds from Mad_Johnny which you can try and let us know what’s the status on that !